Local officials have released results from their assessment of The Jungle, a Seattle homeless encampment where two people were shot to death last month. 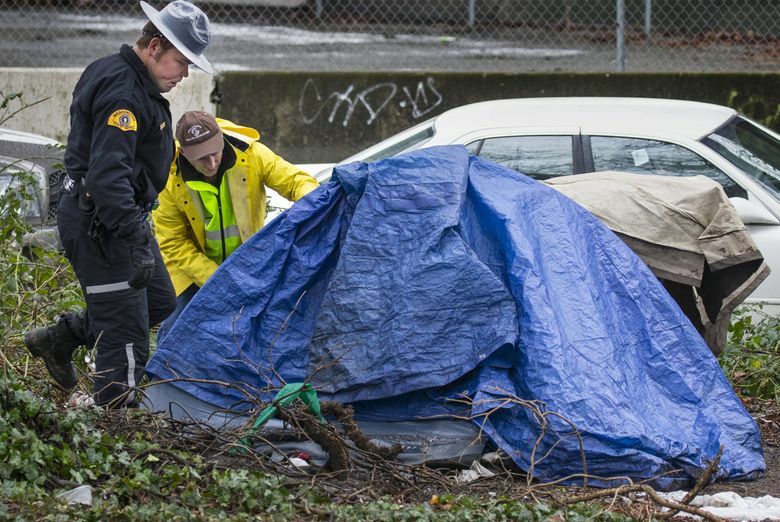 The Seattle homeless encampment known as The Jungle, where two people were shot to death last month, is a lawless zone with unsanitary conditions ripe for spreading disease, according to an assessment by city, county and state officials. The Seattle Fire Department-led assessment — ordered the night of the shooting by Mayor Ed Murray, County Executive Dow Constantine and Gov. Jay Inslee — counted more than 200 tents and other structures in the sprawling encampment under Interstate 5 between Beacon Hill and Sodo and in the brush adjacent to the freeway. Some residents told officials they had been living in The Jungle for weeks and some for several years. The two-day assessment found large amounts of human and solid waste and signs of rodent activity, according to the results released this week. Safety concerns limit efforts by the city to help people living in the encampment access services and housing, according to the Seattle Human Resources Department. There have been more than 70 reported violent incidents, 250 fires and 500 calls for emergency medical service to The Jungle over five years, the assessment found. “The conditions we encountered create a dangerous environment filled with public safety and public health hazards to our first responders and the surrounding community,” Seattle Fire Department Chief Harold Scoggins said in the release. Frequent fires and the accumulation of incendiary materials such as propane tanks pose risks to maintenance personnel working under I-5 to inspect and repair the freeway’s drainage system and expansion joints, according to the assessment. Human waste and trash from The Jungle ends up in a water-runoff system that drains into the Duwamish River — a significant environmental concern, officials said. Murray and King County Prosecutor Dan Satterberg havecalled for The Jungle to be shut down, but that hasn’t happened yet. Most of the site is state property. The assessment and news release included no comments from Murray, Constantine and Inslee on what officials plan to do about the conditions in the encampment. The mayor proclaimed a state of emergency over homelessness in November. The City Council voted Tuesday to release $2.3 million for his emergency effort, with an amendment by Councilmember Lisa Herbold adding $200,000 more to alleviate conditions at unauthorized encampments not already being cleaned up by the city. The $200,000 may be spent on items and services such as hand-washing stations, portable toilets and showers and the collection and disposal of trash and used needles. The annual One Night Count, which last month found more than 4,500 people sleeping outside across the county, skipped The Jungle. Three teenage brothers have been charged with murder and assault in connection with the shooting that left two people dead and three others wounded.